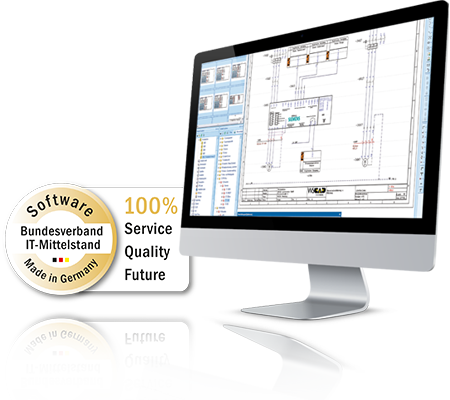 Regardless of whether a classical electrical installation or one with KNX components is involved, the German CAD software ElektroHandwerk (Electrical Trade), which is tailored to the needs of craftsmen and installers, is simple to use and provides all the functions for creating professional installation and distribution plans, including VDE-compliant documentation, at a very favorable price point. The benefits include, among other things, the creation of plans across any number of pages, the functionality of macros, an extensive database with symbols and parts data, as well as free access to wscaduniverse.com directly from within the application. Since the ElektroHandwerk has the same technical basis as the WSCAD SUITE, plans created there in all other versions, including those from other users, can be processed further with the ElektroHandwerk software without any problems. For integrated planning not only within the different trades, but also within the entire industry.